Gloria Steinem and Rosa Parks were kids once, too. 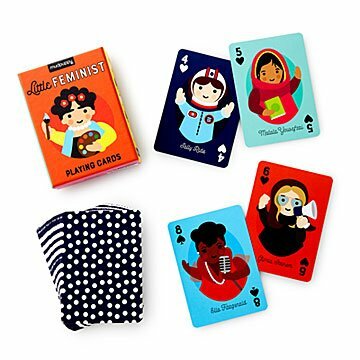 Inspire your little feminist-in-training with this card deck that promotes strong female figures, from Frida Kahlo to Billie Jean King. The adorable illustrations comprise a fully functional deck, but they also encourage thoughtful conversations about who each figure is and why they mean so much on this journey towards equality. Give the playful yet powerful design to a child who has already joined the march, or one who is just lacing up for the revolution. Made in China. They are very good quality playing cards with cute pictures. Black hearts and tiny symbols make these impractical for card game play. Cute concept, but it is too easy to mix up the cards while playing. We enjoyed the femenist images but have to reach for a different deck of cards if we actually want to play a game. My 4 year old granddaughter has questions, lots of questions! This product gives us a great ice breaker for conversations about amazing, strong and justice oriented women and girls.